Barbra Streisand: At 41, she has the same magnetism that she had 20 years ago. In person, the glow seems to come from within, and it has to do with Yentl, her first movie in two years. Barbra Streisand comes down the hall of her home in Beverly Hills and walks into a room crammed with Tiffany lamps, Art Nouveau sculpture and overstuffed chairs and sofas. Her golden brown frizzy hair shimmers like an aura around her head. She appears almost preternaturally youthful: She is slim, clear-eyed, with only hints of aging on her face. The maintenance of super-stardom for more than two decades seems to have taken a modest toll. At 41, Streisand has the same magnetism that she did 20 years ago. In person, at least at this moment. the glow seems to come from within, and it has to do with Yentl, her first movie in two years. Anxious is the cliche adjective for stars awaiting release of their new movies, but Streisand's anxiety here is more than just another opening of another show. She is the star of Yentl, plus its director, co-writer and co-producer — “the first woman in the history of motion pictures to produce, direct, write and perform a film's title role,” boasts MGM/UA, which financed and is releasing the movie. Streisand repeatedly said during interviews that Yentl has obsessed her for 15 years in ways that are intertwined both personally and professionally. And she didn't seem fazed by the repeated rejections of her Yentl project by the movie studios for which her films have made hundreds of millions of dollars. Yentl, they said, was too Jewish or not commercial, or Streisand was too old and fat to play the girl/boy of the plot. “I survived it,” she says simply, her voice slightly hoarse from 20-hour days alternating between the recording studio (where she was cutting new versions of four Alan and Marilyn Bergman/Michel Legrand songs from the film) and the editing room, where she was fine-tuning the final version of Yentl. “I thought that this kind of work would either kill me or make me stronger. And it has made me stronger because I survived,” she concludes. STREISAND IS NOT THE ONLY ONE surprised that she survived Yentl. Her struggle to make a movie about a young girl who pretends to be a boy so she can study the Talmud (writings of Jewish civil and religious law) in an Eastern European-Jewish community at the turn of the century has won her both ridicule and admiration in the Hollywood community. Yentl is the folktale of a young shtetl (Jewish ghetto) girl, daughter of a scholar, who must disguise herself as a boy in order to study the Talmud. Author Isaac Bashevis Singer, in a Shakespearean twist, has Yentl fall in love with a male student who is engaged to the prettiest girl in the village. When their engagement is broken, Yentl (still in disguise) marries the girl. Yentl eventually reveals her true identity and embarks for America, where she will no longer have to pretend to be the person she has already become. Feminists are also awaiting the film, not only because of its dissection of sexual roles, but because they hope that Yentl will demonstrate that you don't need to be a man to make a critically and financially successful film. As she spoke of her childhood on Pulaski Street in the tough Williamsburg section of Brooklyn, in which her only doll was a hot water bottle covered with a dress, her carefully sculpted nails dug into the palms of her large hands in a gesture of nervousness. STREISAND CALLS this quality of her personality "power of the will." It's what enables her to hold a note for so long when she sings. It is what pushed her to get Yentl made, although every studio in Hollywood turned it down at least once. It is, she said, what makes her Barbra Streisand. “I would think, 'I can never make this movie. Maybe Ivan was right; I'm too old. Maybe I'm too famous.' I was so seared that I would talk to everyone about it,” Streisand explained. “And after a while I began to really hear myself, and hear this person talking about this dream they had, but being too frightened to go after the dream. So even Barbra Streisand, that most bankable of female stars, the one actress whose participation in a movie could guarantee an audience, couldn't get her movie made. She was forced into the ignominious position of pitching her project, complete with a Super 8 minimovie she had filmed in Czechoslovakia and a cassette tape of the songs she wanted in the film. After playing them for studio executives, she'd then listen while they talked about why the time just wasn't right for a movie like Yentl. Warner Bros., for whom she had made What's Up Doc?, A Star Is Born and Main Event, wasn't interested. Columbia Pictures, for whom she starred in Funny Girl, Funny Lady, For Pete's Sake and The Way We Were, didn't think the project was commercial. YENTL FINALLY ENDED UP AT UNITED Artists, only to have the studio convulsed by several management upheavals. When the corporate revolving door slowed down, Begelman, her former agent, was the head of the studio and the biggest supporter of Yentl. But the budget at this point was up to $14.5 million, and UA had Streisand in just the position it wanted: UA knew how badly she wanted to make this movie. It was a rare opportunity for a studio to turn the tables on a star. The biggest sticking point between UA and Streisand came over the completion bond, a form of Hollywood insurance in which a private company agrees to pay the budget overruns on a film after the studio pays a substantial, up front fee. In her original contract with UA, Streisand didn't have a completion bond requirement. 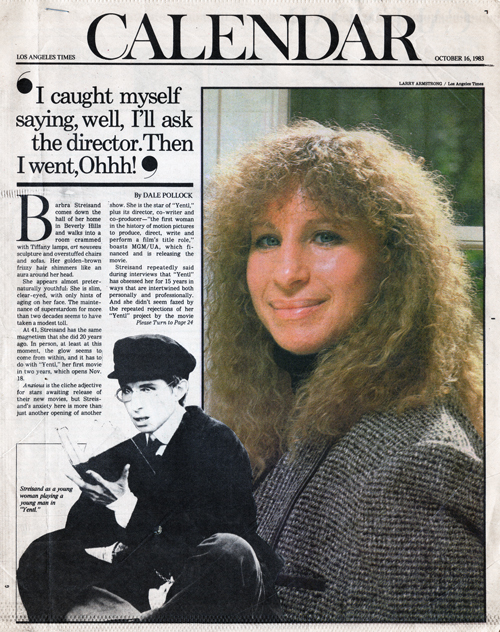 Streisand's involvement with Completion Bond began only after she had finished filming Yentl and was dubbing the sound track, both dialogue and music. At that point, she was $1 million over budget. Completion Bond insisted that she finish dubbing the film in six weeks, or it would take the movie away from her and hire another filmmaker to complete it. Streisand felt she needed ten weeks and offered to put up the $1.7 million (which included the $700,000 advance fee UA had paid) herself. UA was sympathetic, but preferred to deal with the completion company for tax purposes. Actually, there was something Streisand wanted and didn't get for Yentl that taught her an important personal lesson. 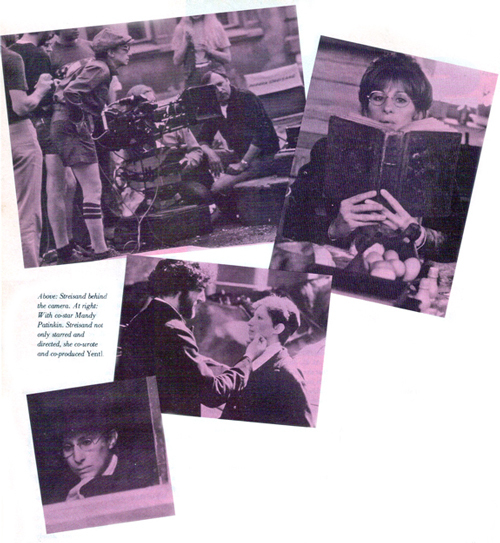 She had hoped to hire Italian cinematographer Vittorio Storaro (Reds) to film Yentl, but using him would have upset the British financing for the movie and added another $250,000 to the budget. ON THE SET IN CZECHOSLOVAKIA, THE costume mistress came up to ask Streisand a question: Would she be wearing the same hat she had on for a just-completed shot in a scene to be filmed later? Streisand the actress had never really made a movie outside the embracing paternalism of a studio, a controlled environment in which she knew everything would be weighted to her best advantage. Streisand the director decided to make Yentl far away from the pressures of Hollywood. In April, 1982, she embarked on her venture. For the first time, she let loose with all the ideas that she had suppressed during her years as an actress, years she had worked to please the director as if he were her long-lost father. “The last few films I made, I'd be acting with somebody and I'd think, 'Boy, this is not truthful.' I'd wait for the director to say, 'Do that again because it wasn't truthful; I didn't believe you.' And I found sometimes he would settle for it. And I had such an urge as an actress to say, 'Don't-please just ask him [for a chance] to do it once more.' That's the part of me that always was building up. But no one took Yentl away from Streisand. Yentl reflects her style of singing with graceful, rhythmic camera movements that she says were inspired by the music. She preferred to film in long, continuous takes rather than short, choppy scenes that could be put together in the editing room. Streisand likens her directing approach to her natural talent in singing. “It is very rare when a moment of inspiration hits you. It's when things come from your unconscious. They pass through your cerebral state, coming from your guts, your soul, the place that's in the very core of you. You can't think about it too much—if you do, it's gone. This is romance of a decidedly different sort, in which Yentl, pretending to be a man, falls in love with Avigdor, played by Mandy Patinkin, who also feels a sexual attraction for her/him. Then Yentl marries another woman, played by Amy Irving, who comes to love him/her. It all sounds confusing to describe, but, in the movie, Streisand manages to explore sexual identities in the unlikeliest of settings, the sexually repressed Jewish shtetls. “I think this is a film about human freedom, male as well as female,” Streisand said. It is a familiar theme in her films, from Funny Girl through Up the Sandbox and Main Event. “Anything to have some social content,” she jokes. But Streisand was making a more serious point, one that slowly dawns on the title character as she accepts her own femininity. 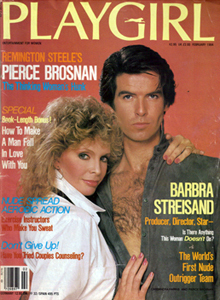 On and off the screen, however, Streisand did assume the role of a man, at least in male-dominated Hollywood. Not only that, she became a Jewish man in an industry whose movers and shakers often seem embarrassed by their Jewishness. One of the controversial aspects of Yentl is its overt religiousness, from its depiction of Eastern European synagogues to its constant Talmudic references in the dialogue. “I hope people talk about the universality of the themes here, not just their Jewishness,” Streisand declared. One assumes that Streisand was always savvy about her career, but this thirst for knowledge has clearly been expanded by the lengthy process of making Yentl. If Yentl discovered new reserves of power and softness within herself from her masquerade as a man, Streisand apparently has benefited in similar fashion from her experience as a filmmaker. Streisand feels that she pushed her own boundaries with Yentl. She would like to direct again-maybe for Spielberg, maybe another subject that interests her as much as Yentl did. DALE POLLOCK writes for the Los Angeles Times and is the author of the best-selling Skywalking: The Life of George Lucas (Crown Publishers). Thanks: scans on this page are courtesy of Jim Miller. This article also appeared in the October 16, 1983 edition of Los Angeles Times CALENDAR.